Penguin Press HC, The, 9781594202544, 272pp. At a moment of ecological and financial crisis, bestselling author and economist Juliet B. Schor presents a revolutionary strategy for transitioning toward a richer, more balanced life. 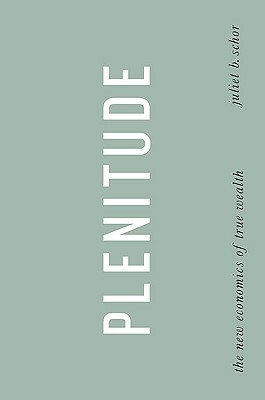 Responding to our current moment, Plenitude puts sustainability at its core, but it is not a paradigm of sacrifice. Instead, it's an argument that through a major shift to new sources of wealth, green technologies, and different ways of living, individuals and the country as a whole can actually be better off and more economically secure. And as Schor observes, Plenitude is already emerging. In pockets around the country and the world, people are busy creating lifestyles that offer a way out of the work and spend cycle. These pioneers' lives are scarce in conventional consumer goods and rich in the newly abundant resources of time, information, creativity, and community. Urban farmers, do-it-yourself renovators, Craigslist users-all are spreading their risk and establishing novel sources of income and outlets for procuring consumer goods. Taken together, these trends represent a movement away from the conventional market and offer a way toward an efficient, rewarding life in an era of high prices and traditional resource scarcity. Juliet B. Schor's research has focused on the economics of work, spending, environment, and the consumer culture. She is the author of "Born to Buy, The Overworked American," and "The Overspent American." Schor is a professor of sociology at Boston College, a former member of the Harvard economics department, and a Guggenheim Fellowship recipient. She is also a cofounder of the Center for a New American Dream, an organization devoted to ecologically and socially sustainable lifestyles.